Ready to go dancing in the Big Apple? 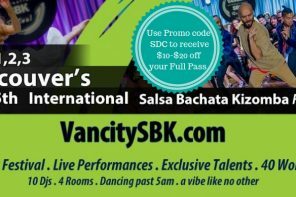 We have a special offer for the 2019 New York International Salsa Congress! Enter the promo code “SDCNY” when selecting your tickets and receive a 20% discount on the purchase price of any ticket/pass. That’s right, 20%!! That’s an incredible deal for tickets to a premier congress in one of the worlds greatest cities for salsa dancing. The Congress is held annually on Labor Day weekend (August 29th – September 2nd) and brings the world together for a week of Latin music, dancing, performances and live bands! This year the event will be held at the New York Marriott Marquis in Times Square NYC. Want a preview of the congress? Check out the recap video of the 2018 edition and then click below to get your tickets! Don’t forget to use promo code “SDCNY” for your 20% discount!